May 19. Okay, so here is the post in which I tell you more about where we’re going than you can possibly want to know, derived from sources from which I steal the information. Don’t feel badly if you don’t retain much of this. I won’t, either. I’m publishing this from San Francisco, where we arrived yesterday evening and stayed at an airport La Quinta Hotel in order to break up (a tiny bit) today’s long flight to Borneo. I’ll write more aloft and hope to be able to post when we arrive. 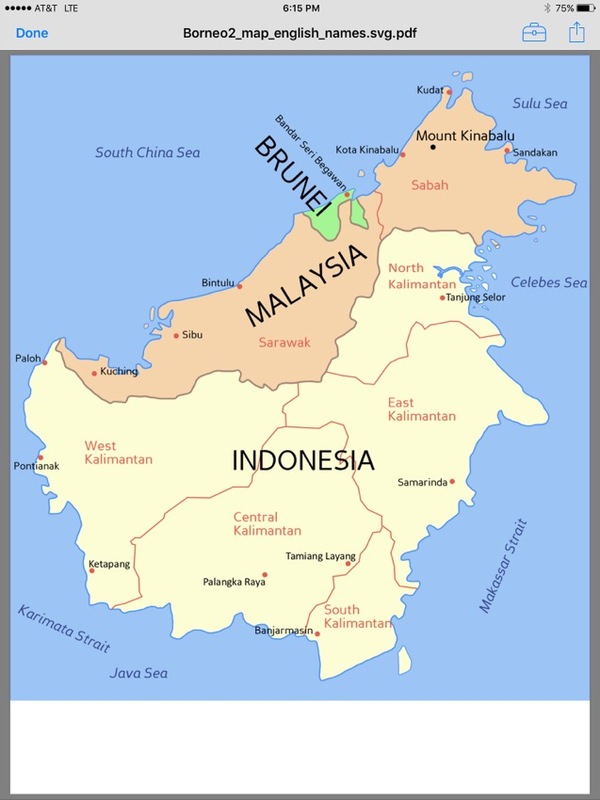 Malaysia is divided almost equally between the narrow strip of land known as Peninsular Malaysia and the northern half of Borneo Island. The two sections are separated by over 300 miles of the South China Sea. Despite this separation, the two areas are geographically and ecologically similar, and in fact, were connected during the ice age by the rainforest covered land bridge of Sundaland. Both sides have areas of dense jungle, high mountains, and long winding rivers. Coastal Malaysia is typified by white sand beaches, amazing coral reefs and coconut groves. One of Southeast Asia’s highest peaks, Mt. Kinabalu towers 13,454 feet above Sabah’s lush forests. The Rejang River and the Kinabatangan flow for over 350 miles through Borneo.
. Approximately seventy percent of Malaysia is covered with rainforest; it is no wonder that both Peninsular Malaysia and Malaysian Borneo have impressive national parks. The oldest and largest on the peninsula is Taman Negara, which covers over 2,500 square miles. Gunung Tahan, the tallest peak in peninsular Malaysia is 7,173 feet high and within the parks boundaries. Sabah and Sarawak’s national parks are more numerous, but smaller in size. The largest being the 2460 square mile park around Mt. Kinabalu. Gunung Mulu, in Sarawak, contains approximately 1500 different species of flowering plants as well as the 30 mile long cave system. Some of the more interesting fauna of Malaysia are the extraordinarily rare Sumatran rhinoceros, the clouded leopard, Malaysian tiger and herds of wild Asian elephants. Unfortunately, we are unlikely to see these animals on our trip, but we should (read: damn well better) see the mighty orangutans of Borneo. We may also encounter the proboscis monkey, several types of macaques, civet cats, tapirs, pangolin (scaly anteater) or the gaur, a member of the wild ox family that can weigh up to 3000 pounds. Malaysia’s most famous flower is also the world’s largest, the rafflesia. This strange carnivorous flower lives underground until it blooms, can grow up to a meter wide and smells of rotting flesh (a trick for catching flies). Over 14,500 other species of flowering plants inhabit Malaysia, many of which are flowering trees and shrubs. From the rare stare fungus and thysmia to a proliferation of pitcher plants, orchids and ginger flowers we are certain to see colorful and wonderful flora while in Malaysia. The native inhabitants of Malaysia, called the orang asli made their homes in the mountainous jungles of the interior peninsula starting some 10,000 years ago. These people were eventually absorbed into the culture of the sea-faring Malays who landed on Malaysia’s coasts after long journeys from islands near the Philippines. The Malays weren’t the only people interested in the peninsula though. Due to its prime location on the shipping routes, the Indians also set up settlements with the Malays, which soon became thriving and splendid kingdoms. The great Hindu kingdoms’ seat of power finally came to rest in Malacca. The great Malay kingdom did not reach its zenith of power until the court’s conversion to Islam. By the 15th century, the Islamic kingdom of Egypt controlled the spice trade to Europe and allowed only Muslims to ship the goods. The newly converted Malay kingdom of Malacca was incorporated into this trading group and soon grew fabulously wealthy. This greatness came to a halt, though, when the Portuguese took Malacca after a month long siege in 1511. Despite their efforts, the Portuguese were unable to take over Malacca’s role in the lucrative spice trade. Rather than deal with the heathen westerners, the wealthy Muslim traders took their business to Islamic Sumatra. The Portuguese held onto the city for over one hundred years, until the Dutch took over in a violent battle. However, the Dutch continued the isolationist policies of their predecessors and Malacca continued to decline. By this time, most of Peninsular Malaysia was controlled by several Sultanates, who battled the encroaching Thai to the north as well as the Dutch. The British became interested in the area at the end of the 18th century, establishing the port of Penang in 1786 and Singapore in 1818 and it was not long before they controlled everything in between the two, including Malacca. The British soon realized that Malaysia had rich stores of tin and that the Brazilian rubber plant was well suited for the environment. British Malaysia soon became the world’s largest supplier of both. The British had also, by this time, taken control of most of what is today Malaysian Borneo through the British North Borneo Company. The period of British prosperity in Malaysia ended abruptly with the Japanese invasion of 1941. The swift defeat of the British by the Japanese destroyed the idea of British infallibility in the Malaysian mind. When the British returned in 1945, they found a population that was no longer willing to be second class citizens in their own country. The Malays and Chinese organized themselves into separate organizations pushing for independence and reforms. In Malaysia’s first national election in 1955, an alliance of the two main groups won a large majority. In 1957, the British relinquished sovereignty over Malaysia and Independence was granted. The Federation of Malaysia was formed in 1961 and originally included the Malaysian Peninsula, Sabah, Sarawak, Brunei and Singapore. However, Singapore and Brunei declined to be in the Federation as they were reluctant to share their wealth with the poorer states. Despite some initial racial tension, regional conflict and economic rebuilding, Malaysia has become a leader in the Southeast Asian political and economic community. Malaysia is one of Southeast Asia’s most ethnically diverse countries. Malay, Chinese, Indians, Europeans and many different groups of indigenous peoples coexist under a single “Malaysian” identity. The majority of the people are of Malay descent. The Malays control most aspect of the government and are predominantly Muslim. Bahasa Malaysia is the primary language of the Malay, but English is also used, particularly when dealing with the other ethnic groups. Until recently, the majority of Malay people lived in the countryside, however, continued government efforts to involve them in the economy has spurred a migration of the Malays from the country to the city. The Chinese comprise about 35 percent of Malaysia’s population. Most arrived in Malaysia during the 19th and 20th centuries from the southern provinces of China, though there are groups of Chinese (the Babas, or Peranakans) that can trace their ancestry in Malaysia to the 15th century. Similar to other Southeast Asian countries, the Chinese control much of the Malaysian economy. Indians make up about 10 percent of Malaysia’s population. Brought from India by the British to provide plantation labor, the Indians are still one of Malaysia’s most disadvantaged ethnic groups. The indigenous groups of Malaysia range from the remaining orang asli of Peninsular Malaysia to the Dayaks of Borneo. There are hundreds of different tribes throughout the country, with many unique traditions and cultures. Many of the Dayak tribes in Borneo still live in the traditional longhouses and retain much of their culture and traditions. However, most Dayak tribes have been influenced by modern culture, so it’s not unusual to see a satellite dish poking up from one end of a longhouse. The religions of Malaysia are as varied as its people. Though Islam is the national religion and is followed by most of the Malay population, Malaysia’s constitution guarantees freedom of religion. Most Chinese follow a mixture of Taoism, Confucianism, and Buddhism and most Indians are Hindus, Muslims, or Sikhs. It is common to have mosques, Buddhist temples, and Hindu shrines within blocks of one another in any Malaysian town. In Malaysian Borneo, most of the indigenous tribes still follow animistic traditions, but Christian missionaries have had their influence, and the number of Dayak Christians has grown considerably. Okay, enough already, right? Relax. There will be no quiz. And future posts will be a whole lot less dense. 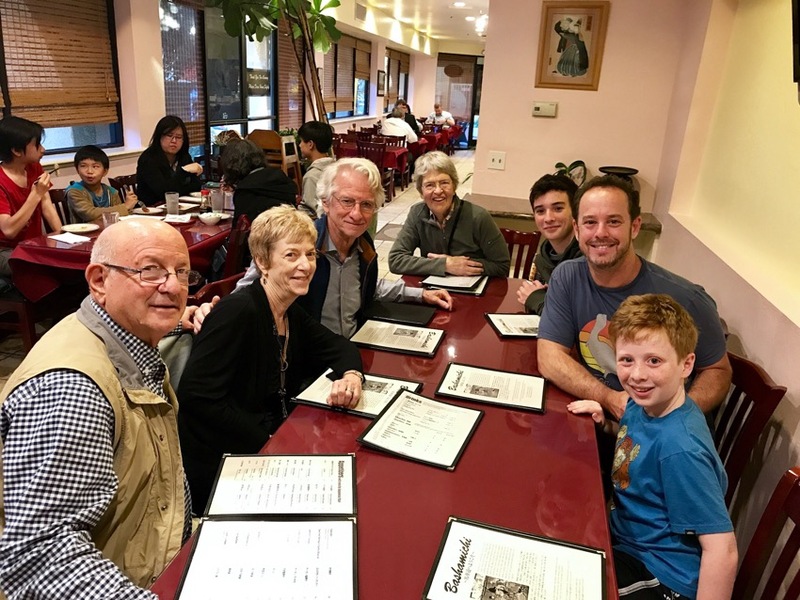 And, finally, here are our dinner companions in San Francisco last nigh–Matt Oshinsky, the son of our close Brandeis classmate, Len Oshinsky, and Matt’s two terrific sons, Ryan and Caleb. Arranged this dinner from the airport in Chicago. An unexpected treat. Great pic of everyone! Fun to see you all together. I genuinely appreciate your time and effort to write and record so much detail. You give the feeling of being “there” with you both, as if the reader is experiencing your adventure with you. Wonderful writing! I agree, great image. I enjoyed the excessive info!